Good morning! It's a rare occasion when you cross paths with someone with whom you instantly click...you admire that person, you share many commonalities, you can talk for hours and never run out of things to say--it's like you've known each other forever, when in fact you've only known each other a few short months. Meet my new bestie Sam Dunne of Dunne With Style...I've never actually met her (she lives in Australia and I'm in the US) but in this day and age of technical wizardry--email, Facebook, Instagram--meeting face to face has proven unnecessary to accommodate our blossoming friendship. I think I've mentioned before how over the moon I was to be asked to participate in Wrap It. For one, I was asked by this very special lady to join her talented group of gift wrapping artists; and two, gift wrapping and embellishment kits are so close to my heart and I love to conjure them up. There is something special about Sam and there is something calming about her kit and her photos. They are akin to a warm bath--you sit back, relax, and soak them in, all the while being infinitely inspired. Perhaps it's in all the lovely shades of mint and aqua and the cozy introduction of fabric...I can't quite put my finger on it, but her ensemble just warms my heart. 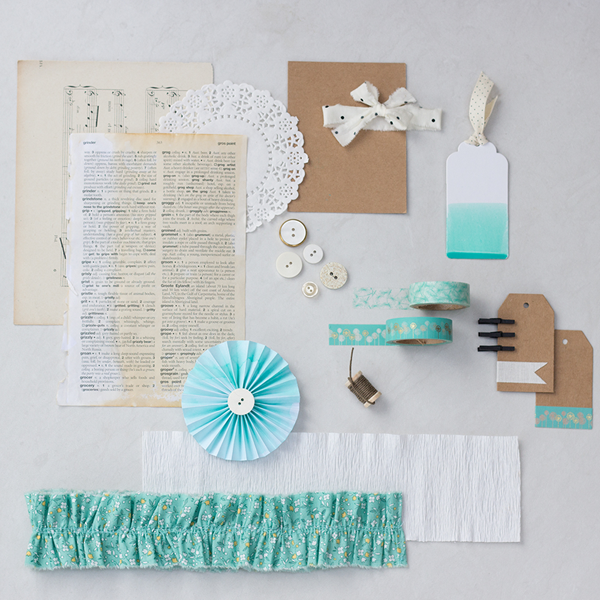 She has spent countless hours ruffling the fabric wrap; she watercolored the paper rosettes and the white tag, and you will read of all the other personal touches that are woven into this assortment. 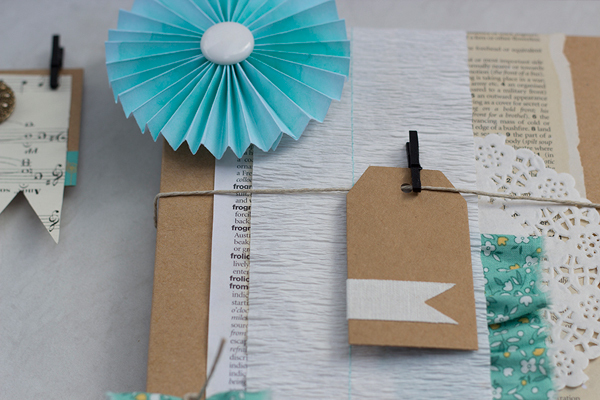 If you've ever wished to delve into the art of prettying up your packages, Sam's Wrap It kit is the perfect place to start. What is your intention with Wrap It? What do you hope customers will get out of purchasing these kits? I've always had an obsession with gift wrap; I think it has an effect on the receiver that is difficult to describe. It's like an unwritten expression of thoughtfulness, an unwritten note that exudes generosity. But sometimes where to begin and having to source and stockpile all the little 'bits and pieces' can leave inspiration and motivation levels low. I wanted to create a series of kits that showcased the amazing talents of 8 creatives and let them inspire and simplify the way we create beautiful gifts. 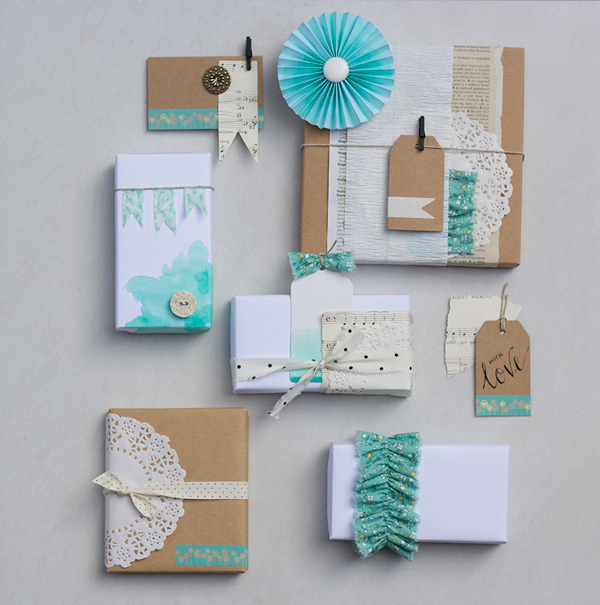 My Wrap It kit is the culmination of my favourite supplies to use in my most loved colour palette: mint, white, black and kraft brown. I wanted to include as many textural elements as possible and teach people how to add depth and layers with just a few elements. It was inspired by the fabric which I've turned into a ruffle (it comes all ruffled up and ready to use!) which is a fabric I used for Nate's 1st birthday party, so not only do I love the colour and the print but it comes with fond memories of his birthday. From there I painted some watercolour paper and made the rosette, which are often my go-to items to quickly jazz up a gift. The Dailylike 'dandelion' washi tapes are my favourite patterns and the colours tied in perfectly, too. 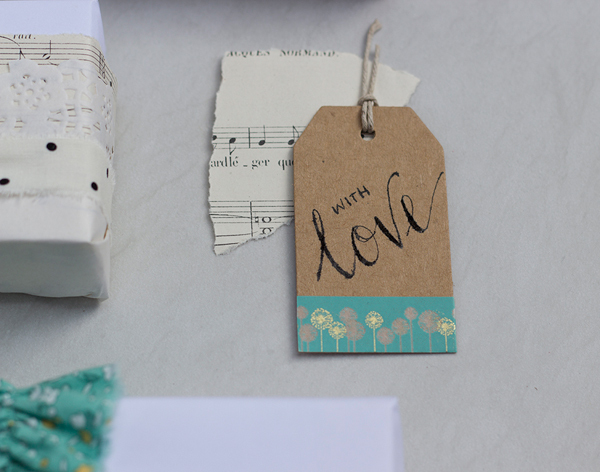 The mints are balanced by the vintage browns in the tea-stained dictionary sheets and vintage music sheets, and the hint of black begins in the print of these papers and is carried through to the spots on the fabric ribbon and tape and the black mini pegs. A few white doilies brighten up the collection, and no wrap kit is complete without a roll of twine, so a mini bobbin of hemp twine is included, too. 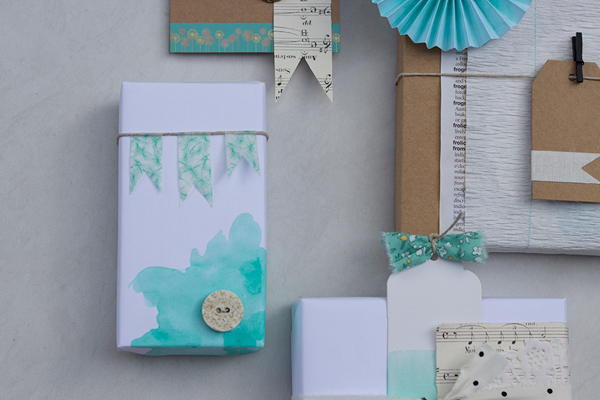 When did you fall in love with gift wrapping and what inspired that love? As a child I remember asking Mum if I could keep the ribbon when she received a birthday present; I'd sneak the tissue paper from bunches of flowers Dad would bring home for her and stockpile my 'collections' to re-use and re-wrap gifts later on. These days I can often be found spending more time wrapping the gift than I did shopping for it. I've always found it a really cathartic exercise and everyone that receives a well-wrapped gift is always so grateful, so it's a feel-good project for both the giver and the receiver. Everywhere! I'm always looking for inspiration and find if you keep your eyes open the world is a pretty inspiring place. I find colour and colour palettes the most inspiring, so I'm always looking at colour combinations in homewares, fabrics, rugs, bed linen - I often find the way they combine or contrast colour will inspire an entire project. And if I'm really stumped I head to the local hardware store and stand in front of the paint chip section (and often come home with an armful of them). I'm always looking outside for the way that colour and texture work in the natural world, too, as nature never seems to get it wrong! The Wrap It idea originated when someone said to me, "I wouldn't even know where to start to wrap something like that." I instantly wanted to hand them a box of 'where to start' and inspire them to get creative. 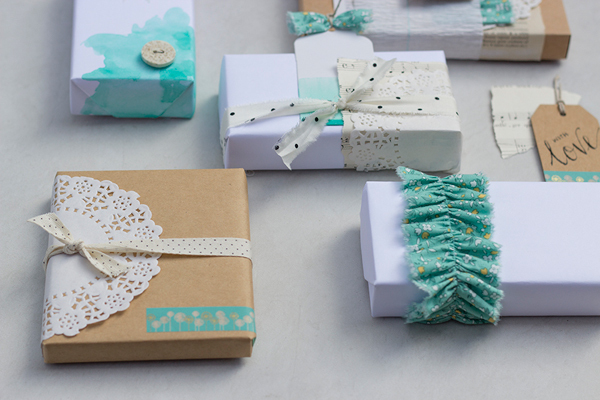 What 3 items would you be lost without when it comes to gift wrapping? Brown paper (matte, never shiny or glossy, and the more textural the better) - it's a staple in my house that I buy in bulk; it's the perfect base for an infinite amount of colours, textures, and toppers. String - in as many forms and varieties as possible--baker's twine, garden twine (it's thick and rustic and ridiculously cheap from the hardware store! ), hemp cord...whatever I can lay my hands on. Fabric - gift wrap should always involve texture. Texture gives depth, which is an inviting property, it draws people in; you want the recipient to want to touch and feel it and fabric is so good at doing this. My favourite is simple cotton fabrics, plain colours or small prints - tear it up into strips and use as ribbon or a band with it's frayed edges. And, just for fun...What do you listen to when you're crafting away? Today, Above the Clouds of Pompeii, by Bear's Den. Wow! Are you inspired to get wrapping yet?! Just a reminder, there is a new kit shipped each month. There are a limited number of kits available so the sooner you purchase, the better. Sam's is shipping now! Please feel free to ask any questions about Wrap It in the Comments section of this post--I'm more than happy to answer them! Very cool! Gorgeous color. So simple and beautiful, I love it!